After an arrest for a first-time DUI, you might be eligible for the new DUI diversion initiative in Hillsborough County called Reducing Impaired Driving Recidivism (“RIDR”). The State Attorney’s Office expects about 20% of DUI cases to be eligible for the new diversion program that began on March 1, 2018. Keep in mind that within 10 days of the arrest, you still need an attorney to help you demand a “formal review hearing” to contest the administrative suspension of your driver’s license. If you go to the DHSMV seeking immediate reinstatement of your hardship privileges, then you are basically stipulating that you were DUI for administrative purposes. That notation remains on your driving record for the next 75 years (even if you complete the RIDR diversion program and get the criminal history record sealed). In other words, don’t go down to the DHSMV to waive all your rights until you speak to an attorney and learn more about the benefits of letting your attorney demand a “formal review hearing” on your behalf. Getting the best result in your case might come with entering RIDR and winning your formal review hearing to invalidate the administrative suspension so that it disappears from your driving record. 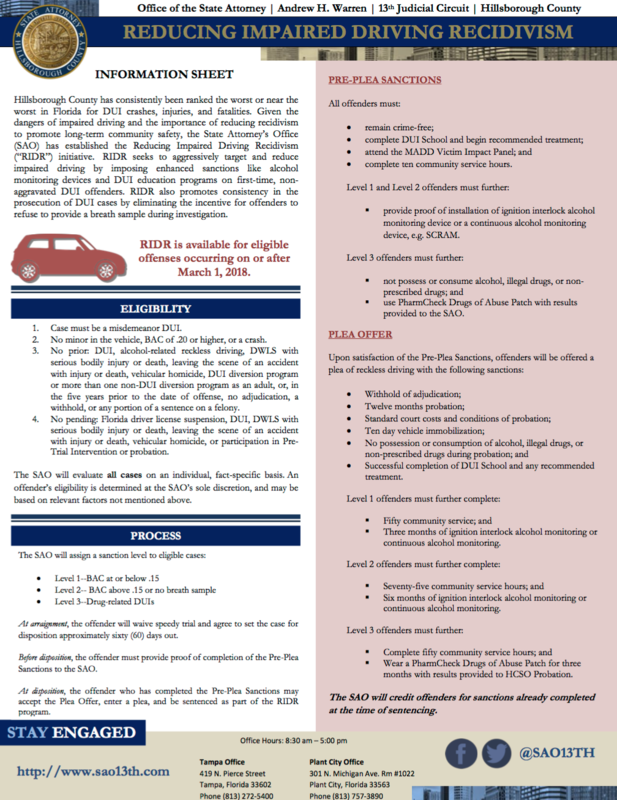 The RIDR initiative requires you to complete the typical sanctions for a first-time DUI plus it requires the installation of an ignition interlock device, SCRAM monitor, or PharmCheck Drugs of Abuse Patch (if your DUI case was drug related). agree to a sentence of twelve (12) months probation to complete the enhanced sanctions (with the possibility of early termination). NOTE: The State Attorney’s Office has made it clear that ALL CASES are evaluated on an individual, fact-specific basis. A defendant’s eligibility is determined at the sole discretion of the Office of the State Attorney for the Thirteenth 13th Judicial Circuit. For this reason, it is important to have an attorney help you with the process so that you have the best chance of being accepted into the program and so that you are able to complete everything quickly. An attorney can also help you get your probation terminated early and then seal your record if you are eligible after your case is over. If you successfully complete the probation and have no prior convictions, you will be eligible to seal the criminal record. On the other hand, if you don’t complete the requirements, then your probation officer can obtain an arrest warrant because of the violation of probation. If the court finds that the violation of probation was willful, then the court can adjudicate you guilty of the underlying offense of reckless driving and impose up to the statutory maximum of 90 days in the Hillsborough County Jail. After an arrest for a first-time and non-aggravated DUI offense, contact an experienced DUI defense attorney at Sammis Law Firm to find out how the new diversion program might impact your case. For a first-time offender, this diversion program might provide a good way to avoid a DUI conviction. Not everyone will be eligible for the diversion program. Even people who meet the screening criteria might be deemed ineligible because the State Attorney’s Office decides not to allow them to participate in the program. If you are eligible, it is important to consider the pros and cons of entering the program based on the specific facts and circumstances of your case. Contact a DUI defense attorney at the Sammis Law Firm in Tampa, FL, to learn more about the benefits of entering the RIDR DUI diversion program in Hillsborough County. On February 19, 2018, Rena J. Frazier, the Chief of Policy and Communication for the State Attorney’s Office in the 13th Judicial Circuit in Hillsborough County, FL, announced the new DUI initiative called Reducing Impaired Driving Recidivism (RIDR). According to the State Attorney’s Office, the new DUI diversion program in Tampa, FL, is aimed at reducing impaired driving through enhanced sanctions. The State Attorney’s Office invited criminal defense attorneys in both the private sector and at the Public Defender’s Office to attend an informational meeting about the new RIDR program on Monday, February 26, 2018, at the Edgecomb Courthouse, located at 800 E. Twiggs Street in downtown Tampa, FL. More than 100 criminal defense attorneys attended the meeting where State Attorney, Andrew Warren, explained the eligibility conditions and procedures. At that meeting, the State Attorney’s Office recently announced that the RIDR diversion program would become effective on March 1, 2018. After the presentation, criminal defense attorneys had an opportunity to ask questions and voice their concerns about the procedural requirements. According to the State Attorney’s Office, Hillsborough County has consistently been ranked near the worst in Florida for DUI crashes, injuries, and fatalities. Given the dangers of impaired driving and the importance of reducing recidivism to promote long-term community safety, the State Attorney’s Office decided to create the Reducing Impaired Driving Recidivism (“RIDR”) initiative. The goal of RIDR, according to the State Attorney’s Office, is to promote consistency in the prosecution of DUI cases. The program also seeks to eliminate the incentive for offenders to refuse to provide a breath sample during the investigation, although this particular goal is greatly diminished by the fact that anyone who has a BAC of .20 or higher is not eligible for the diversion program. RIDR was also intended to aggressively target and reduce impaired driving by imposing enhanced sanctions like alcohol monitoring devices and DUI education programs on individuals accused of a first-time, non-aggravated DUI offense. The State Attorney’s Office in Tampa, FL, has made it clear that it will evaluate all cases on an individual, fact-specific basis when determining eligibility. As the offender’s eligibility is determined at the SAO’s sole discretion, it may be based on relevant factors not mentioned below. For instance, the State Attorney’s Office did not indicate here whether the holder of a commercial driver’s license would be eligible for the program, but shortly thereafter they decided that the typical CDL driver would not be automatically eligible for the RIDR program even when the DUI arrest involved driving a personal vehicle and not a commercial vehicle. any adjudication or withhold of adjudication to any felony within the last five years before the date of this offense. The defendant is not currently being supervised in any Pre-Trial Intervention (PTI) program or on probation. It is possible that the State Attorney’s Office might be flexible on one or more of these conditions under the right circumstances, so even if you think you might NOT be eligible, it is a good idea to talk to an experienced criminal defense attorney about the eligibility requirements. Even if you are not deemed to be eligible to enter RIDR, the prosecutor might still be forced to reduce the case to reckless driving based on the weight of the evidence or problems with proving their case. In those cases, your attorney will file motions to suppress illegally obtained evidence, motions to exclude unduly prejudicial evidence, or motions to dismiss the charged based on insufficient evidence. At the arraignment, the defendant must express their desire to be considered for the program, waive speedy trial, and agree to set the case for disposition approximately sixty (60) days out so the SAO has time to determine their eligibility. Before the next court date (often called the first disposition or the “disposition court hearing”), the defendant must provide proof of completion of the Pre-Plea Sanctions. At the information meeting on February 26, 2018, many criminal defense attorneys expressed concerns that it would not be possible to complete all of the pre-plea sanctions within that time period. The State Attorney’s Office expressed a willingness to be somewhat flexible on that requirement during the transition phase of the initiative. completing ten (10) community service hours. provide proof of installation of an ignition interlock alcohol monitoring device or continuous alcohol monitoring device, e.g. SCRAM. use the PharmCheck Drugs of Abuse Patch with results provided to the SAO. Successful completion of DUI school and any recommended treatment. Install the ignition interlock alcohol monitoring device or any continuous alcohol monitoring device for three (3) months. Install the ignition interlock alcohol monitoring device or any continuous alcohol monitoring device for six (6) months. Wear a PharmCheck Drug of Abuse Patch (PharmChek® Drugs of Abuse Sweat Patch) for three (3) months with results provided to HCSO probation. The State Attorney’s Office will credit the defendant for the completion of sanctions already completed after the arrest but before the time of sentencing. Because the defendant is eligible for early termination, it would make sense to begin the special conditions as quickly as possible before entering the plea so that that time spent on probation is minimized. An attorney can help you decide the best way to complete the various conditions of the RIDR Program. Keep in mind that you are responsible for successfully completing all requirements and providing proof of completion to your attorney. You are responsible for any costs associated with the completion of these sanctions. How Do I Enroll in DUI School? To enter RIDR, you must provide proof to your criminal defense attorney that you have completed DUI School so that your attorney can present that information to the State Attorney’s Office. You must complete a Florida-licensed DUI school. If you had a driver’s license out of state at the time of the arrest and you are not a Florida resident, talk with an attorney about this requirement. The Florida-licensed DUI school in Hillsborough County is DUI Counterattack. To register for DUI school you can go to http://www.duicounterattack.org or contact them at (813)875-6201 (Tampa location- 4711 N. Hubert Ave.) or (813)875-6201 (Brandon location-1063 E. Brandon Blvd.). For licensed DUI schools in other counties, go to https://www.flhsmv.gov/driver-licenses-id-cards/educationcourses/dui-and-iid/licensed-dui-programs-florida. You are permitted to register for DUI school in the county in which you work or reside. How Do I Complete the Victim Impact Panel? To enter RIDR, you must provide proof to your DUI defense attorney that you attended the Victim Impact Panel so that this information can be provided to the State Attorney’s office. You must complete one session of the Victim Impact Panel. You can register for a Victim Impact Panel at https://www.maddvip.org/ or contact MADD at (813)273-6233 ext. 7296. The Victim Impact Panel begins at 6 p.m. and is located at the Ja.il Assembly Room on the north end of the building at 520 N. Falkenburg Rd., Tampa, FL 33619. The dates for the Victim Impact Panels scheduled in 2018 are January 15, February 19, March 19, April 16, May 21, June 18, July 16, August 20, September 17, October 15, November 19, and December 17. How Do I Install the IID or SCRAM? To enter RIDR, you must provide proof to your lawyer that you have installed an ignition interlock alcohol monitoring device or that you have a SCRAM continuous alcohol monitoring device so that this information can be provided to the State Attorney’s Office. You must install an ignition interlock device in your vehicle or begin wearing a SCRAM continuous alcohol monitoring device. Keep in mind that not all judges in Hillsborough County, FL, have promised to go along with RIDR in the sense that they reserve the right to reject any offer that involves a withhold of adjudication. Several of the judges have voiced concerns that installing an ignition interlock device (IID) before trial is pointless because the person can just drive another vehicle that doesn’t have an IID. Instead, some judges have indicated that they want to see the install the SCRAM device before they will agree to a withhold of adjudication. Whether you should install the IID or SCRAM is an important decision. Talk to an experienced attorney before you decide on a course of action. Tampa Bay Monitoring at https://tampabaymonitoring.com/ or call 727-535-6506. How Do I Complete the Community Service Hours? You must also provide proof of the successful completion of ten (10) community service hours to your DUI attorney so that this information can be provided to the State Attorney’s Office. Community service hours are volunteer hours that you complete through a community organization of your choice. According to the State Attorney’s Office, these organizations may include a charity, a house of worship, or a school. Proof of community service hours must be turned in on the agency’s letterhead, signed by the person supervising the hours, and include the date and number of hours of service. You may not receive pay or compensation for the hours. You cannot pay for or “buyout” your community service hours. You cannot donate money in exchange for hours. Hours must be completed after the date of offense for your charge. The term “recidivism” is defined to mean the tendency of a person accused of a crime to re-offend. As the name implies, the Reducing Impaired Driving Recidivism (RIDR) is intended to reduce the number of people who re-offend after being arrested for DUI. Only time will tell if the new diversion program with be successful in reducing the number of people accused of DUI and the overall number of DUI crashes and fatalities. In many jurisdictions throughout Florida, a person arrested for a first DUI offense is offered entry into a diversion program. Those jurisdictions with a DUI diversion program include Orlando, Palm Beach, and Miami. The purpose of the DUI diversion programs in those jurisdictions is to help a first-time offender avoid the stigma of a conviction while reducing recidivism rates. For example, the DUI diversion program in Palm Beach County, FL, also makes a BAC of .20 or below an eligibility requirement. The program also excludes anyone driving with an animal or pet in the vehicle at the time of the arrest.The DUI diversion program in Palm Beach County also excludes anyone who has previously completed another diversion program (specifically excluding any juvenile diversion program). The DUI diversion program in Palm Beach County also excludes anyone who has previously completed another diversion program (specifically excluding any juvenile diversion program). The Florida Impaired Driving Coalition (FIDC) created a DUI Program Review Board to monitor and conduct annual site inspection visits for all facilities that administer DUI programs in Florida. In June of 2017, FIDC created the Goals for DUI Diversion Programs Subcommittee. A report on the goals of the subcommittee was largely critical of DUI diversion programs in Florida because they were created without legislative oversight, statutory foundation or compliance with existing pretrial diversion statutes. 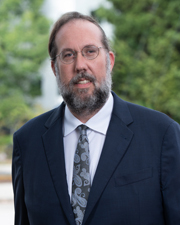 “There are no studies that demonstrate that diversion programs reduce recidivism (NTSB, 2000, p. 28) and there is substantial anecdotal evidence that diversion programs, by eliminating the offense from the offender’s record, allow repeat offenders to avoid being identified (Hedlund and McCartt, 2002, p. 38). The FIDC also noted ethical problems created by the fact that DUI diversion programs enrich private and non-state regulated entities by requiring participants to attend a MADD Victim Impact Panel (VIP) or make a donation to MADD. SCRAM Continuous Alcohol Monitoring Device – Visit the website of the National Institute of Justice to learn more about the evaluability assessment of the Secure Continuous Remote Alcohol Monitoring (SCRAM) Technology. SCRAM systems are tamper-resistant automated alcohol-monitoring devices. These devices use transdermal testing to measure the amount of alcohol in person’s body (the transdermal alcohol content (TAC)). When the person drinks alcohol, ethanol travels through the skin and is excreted through perspiration. The SCRAM device sends data that can be entered into a report that shows when the subject consumed alcohol.